David Tecchler (c. 1666–c. 1747) was the greatest of the Roman cello makers. Originally from the Bavarian town of Füssen on the northern slopes of the Alps, Tecchler came to Rome at the end of the 17th century. Over a working career of roughly 50 years, he made violins, violas, cellos, basses and some mandolins and lutes, but he is best known for his cellos. These are built on a large and broad pattern with a rounded full arch and an overall very powerful appearance. Tecchler’s materials were generally of excellent quality with the cellos in particular often using figured spruce and attractive maple covered in a tawny orange-brown varnish. Tecchler soundholes are a unique blend of Stainer and Amati influences with large and often rounded notches, elegant curved stems and tapered wings. They are set wide apart and low in the belly, giving them an easily recognisable appearance. The scrolls are also highly distinctive with a very narrow width between the ears, a deep and finely carved volute, and a chunky eye. Tecchler cellos have long been favoured by soloists for their colourful tonal range and their powerful, commanding resonance. The back of this handsome cello is made of two pieces of ‘oppio’ maple with a narrow, rippling curl. Some sections are cut squarely on the quarter with horizontal flame, and others show a more slab-cut, irregular figure. The outline has been reduced to its present length of 73.4 cm but the central section – the corners and C-bouts – has been left untouched. The white of the purfling is in beech, as is typical of Tecchler, and the dark strips are stained a rich black. The arching is moderately full but the edges are fluted generously, with the lowest point of the channel set in a considerable distance from the purfling. The ribs are of similar maple to the back but cut squarely on the slab. Abundant plane and scraper marks, particularly on the ribs, give the cello a rich, rustic charm. The scroll of this cello was made by Giovanni Grancino in Milan. It is not known when it was joined to the body but we can assume the original Tecchler head had been damaged in some way that prevented it from being adequately repaired. Stylistically the Grancino head is of the same period and suitably matches the strong and masculine character of the cello. The front is striking in appearance both for its quality of spruce and for the elegance of the soundholes. Like many makers in Italy at the turn of the 18th century, Tecchler was greatly influenced by the Tyrolean maker Jacob Stainer. The soundholes of this cello show a Stainer influence, but their position on the belly of the instrument is distinctive to Tecchler. The distance between the upper lobes of the soundholes is an extreme 122 mm (this distance on a Stradivari forma-B cello is 92–93 mm). Likewise, the stems of the soundholes are slightly angled and taper more than a typical Stainer pattern. The spruce is of the highest quality and shows beautiful hazelficte, particularly in the lower bouts. The cello is covered in a vibrant golden-brown varnish. The term ‘violoncello’ did not come into existence until the late 17th century, and the early instruments we nowadays refer to as cellos were in fact originally conceived as bassettos or violones. 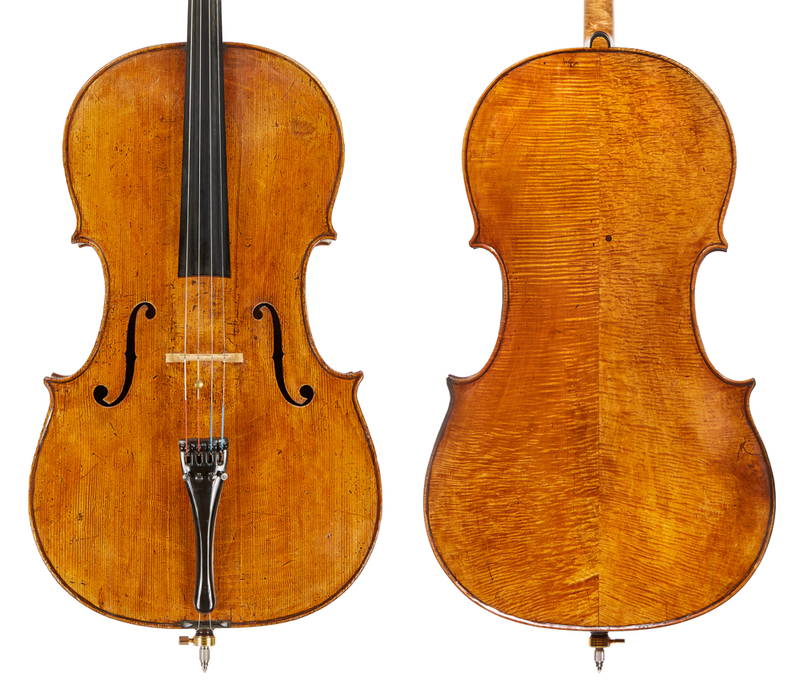 Nearly all 16th- and 17th-century precursors to the cello were larger than the modern standard, and instruments made by Tecchler were originally built a full 2–3 cm longer than the size we see today. Thanks in part to advancements in string-making technology, cellos with smaller body sizes began to be developed in the early- to mid-18th century, making it easier for cellists to play emerging virtuosic solo repertoire. The old, large-sized instruments soon became outmoded, and most violones were reduced in size in the following centuries. The distinctive figurations running perpendicular to the grain on the top of this instrument are commonly seen in spruce used by Tecchler for his cellos. Known as hazelficte, this irregularity is found in dense, slow-growing spruce and for some instrument makers it indicates wood of superior tone qualities. Hazelficte causes a ripple in the normally straight grain of spruce and produces an irregular pattern similar to the flame of curly maple. 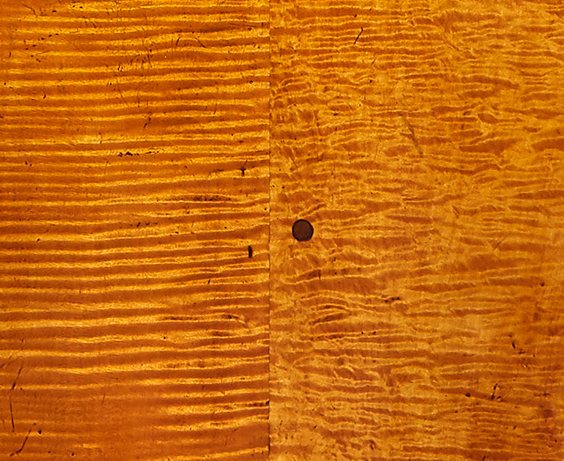 For whatever reason, Tecchler cello tops are often highly marked with hazelficte, whereas the pattern is much less common in cellos from Cremona, Milan or Venice. In English hazelficte is known as ‘bear claw’ as the irregular, crescent-shaped figure looks like scratches from a bear. In Italian the wood is called abete macchiato. Like many classical cellos, this instrument has a small round plug inserted just above the mid-point of the back, close to the centreline. Known as the ‘processional hole’, this is believed to be the point where a strap that musicians wore around their neck, was attached to the cello to support its weight. The term refers to the idea that cellists were required to carry the instrument in processions, though the strap could have also been used to support the cello when seated. Early iconography shows players holding the instrument between their legs, supporting it on a fixed wooden peg, or suspending it with a strap from their neck or shoulder. Evolving styles of playing in the early- to mid-18th century meant the processional hole was no longer necessary, and they were filled with the vestigial plug we see in the back of classical cellos today. The modern day adjustable end-pin, allowing cellists to position the instrument at the optimum height and angle, remarkably only came into widespread use in the late-19th century after it was made fashionable by the Belgian cellist Adrien Servais. Read our interview with Guy Johnston about his cello and how he marked its 300th anniversary with a trip to its birthplace in Rome.